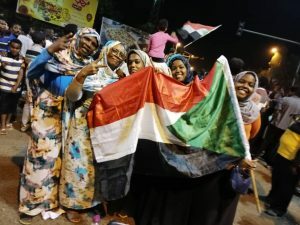 Sudanese women have led the #SudanUprising popular movement against the regime of Omar al-Bashir, they cannot be excluded from the country’s transition. The world has watched as huge, peaceful protests have swept across Sudan, leading to the apparent resignation of the man who has led the country for nearly 30 years. This popular movement has been dominated by women, who have reportedly made up two thirds of its numbers. The departure of Bashir is an important step, but the announcement of a two-year transition led by the military is not what brought millions of Sudanese onto the streets. A ‘palace coup’ would be a betrayal and frustration of the aspirations of the people of Sudan. During the course of the protests, serious human rights violations have been committed against the population. Perpetrators must be held accountable, and a bogus transition threatens that justice. Just as the popular movement has been civilian-led, so must be Sudan’s transition, with the military, police, security services, and support forces playing a distinct and limited role. Crucially, the transition must be inclusive. Sudanese women have long shown their strength and determination for justice and equality, women like the late Fatima Ahmed Ibrahim. #SudanUprising has brought the world many new Sudanese icons. But the women leading chants of “thawra” (revolution) cannot simply be reduced to just symbols of courage and resistance – they are the living, breathing present of Sudan. The African Union High-Level Implementation Panel, the Troika of the United States, United Kingdom and Norway, and the European Union have a responsibility to ensure a peaceful, orderly, and inclusive transition in Sudan. They must not support a military-led transitional council. Women and men have been protesting and singing in unison on the streets of Khartoum, Omdurman, Port Sudan, and across the country. That spirit of unity must continue in Sudan’s transition.